A wide variety of options are available if you are tossing around the idea of purchasing an indoor grill. Today we are reviewing three of the highest rated options, from such well-known manufacturers as Hamilton Beach (the king of entry level small appliances) and George Foreman (that’s right, the man behind the Lean Mean Grilling Machine). There is nothing quite like a beautiful, flame-kissed chunk of meat. Perfectly seared medium rare steaks, burgers with those perfect grill marks running across them, juicy stuffed jalapenos, and anything and everything in between. But there are so many problems with outdoor grilling, one of the biggest being, “what if I don’t have a yard?” Fear not, as we are here to solve that crisis with the perfect solution: indoor grilling for fun and profit. Let’s face it: we don’t all have backyards or patios or balconies that are uncovered. Grilling is a pipe dream that a good percentage of the developed world requires a restaurant and greatly inflated prices to enjoy. If you live in a cramped apartment or condominium in a bustling metropolis, you know the feeling. Some apartment complexes come with those picnic-area style grill boxes that look like they went through an atomic blast and have melted leftovers from the prior fifty meals. Sometimes, you may have a grill and a yard, but we all know that this isn’t a year-round activity. Families in colder areas can only utilize their grills in the summer months. People in hotter areas, such as Florida, rarely want to spend a half hour over a 600-degree fire when the temperatures outside are closing in on 100. Luckily, there is a way to grill from the comfort of your kitchen. Indoor grilling machines make it possible to enjoy your grilled foods despite any of the above hindrances. Though the flavor, feel, and experience of indoor grilling might not hold a candle when compared to its outdoor counterpart, it is still a much welcome alternative when getting the real thing is not a possibility. Heck, grilling is one of the healthiest methods of cooking meat and vegetables. Foods naturally high in fat, such as hamburgers, steaks, and pork are far better grilled than fried. When grilling, excess fat drips down into the space between the grill grates. When frying, this doesn’t happen, as the fat has nowhere to escape. Grilled vegetables are also more nutritious when compared to boiling or steaming, as more of the vitamins and nutrient composition is retained on the grill. Furthermore, people who eat grilled foods naturally prefer them fresher. Stale or canned foods and grilling do NOT mix well. For this reason, grilling can indirectly encourage the consumption of healthier foods. How about that! Besides the obvious advantages of offering the possibility of grilling your favorite foods from the comfort of your kitchen, many indoor grilling machines can halve the amount of time it takes to properly grill by grilling the food on both sides simultaneously (think waffle iron). This makes the grilling process faster and more effective. These indoor grills are specially designed to emit far less carbon monoxide, which is better for you and your environment. Also, since you aren’t cooking over an open oven burner, you don’t run the risk of having your kitchen coated in atomized grease particles. If you’ve cooked bacon on a glass cooktop without a proper cover, you know exactly what we are talking about! While it is true that getting the exact flavor that an outdoor grill provides isn’t exactly possible with any old indoor grill, the Hamilton Beach 253261 is truly as close as it gets. Its amazingly high searing temperature is perfect for proper cooking, and you can be assured a tender, well-grilled final product. The grill also comes with a temperature adjustment feature to allow you to cook your favorite meals at any temperature between 200 and 450 degrees. This makes it suitable for almost any grilling style or kind of food. An indicator light is located front and center on the Hamilton Beach model to tell you when your grill is at the proper temperature and ready for action, and a lid window allows you to monitor your food throughout the entire process. The drip tray is extra-large, providing a seemingly boundless cooking area. Multiple servings can be cooked at once, shortening overall cooking time, which is especially helpful if you work full-time and prepare meals, or for when you invite friends over. The cooking surface is non-stick and dishwasher safe, and the grill cover can also be detached to facilitate easy cleaning. These features make this Hamilton Beach machine perfect for your busy schedule. The grill is constructed from stainless steel, and the quality and durability of the construction materials aren't up for debate. The large tray is complemented by an equally large drip pan that collects any fluid that escapes from the food being grilled. This ensures that grilling is never a messy process. The tray is removable for easy cleaning, and like all other components of this appliance, it is dishwasher safe. This indeed is a perfect grill for your meat, vegetables or any other food you wish to enjoy grilled. From none other than the leading name in the world of indoor grills, this 4-serving, removable plate grill is a real thing of beauty. 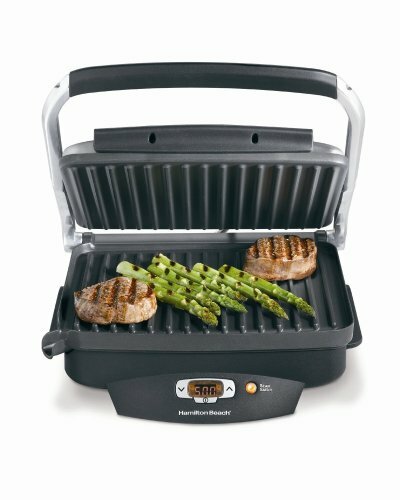 Although its tray isn’t as big as the previously reviewed Hamilton Beach 25361 or the Hamilton Beach 25331 (see below), it is still big enough for most routine grilling purposes, with the ability to accommodate four full servings at once. The real strength of this machine, though, lies in its cooking time. The George Foreman company boasts that it is capable of heating up 35% faster than the previous model, and we found that this is no bluff. 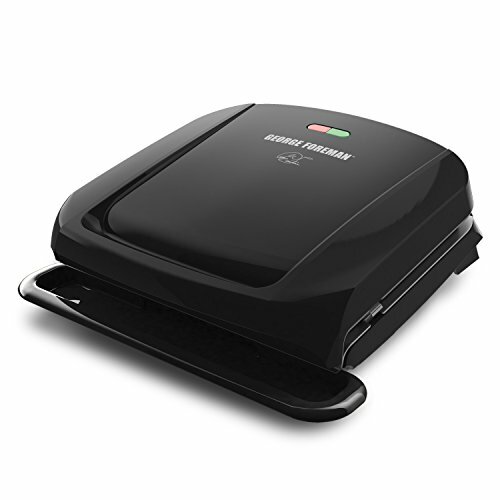 The George Foreman 4-Service Removable Plate Grill and Panini Press’ extremely fast heat-up time ensures meals can be perfectly cooked in 10 minutes or less. This grill is also specially designed to reduce the amount of fat consumed in the end product. This is achieved through its sloped grilling surface which could help drain up to 42% fat, acting much like its predecessor, the original Lean Mean Fat Grilling Machine (yeah, you remember George’s commercials). The advanced non-stick coating also ensures grilled foods do not stick to the tray, minimizing the need for excess oil and butter during cooking. A drip tray is also available to collect exudates from your food, ensuring that your kitchen is never a mess due to grilling activities. All the plates are removable and dishwasher safe, so there is no hassle experienced when cleaning up the machine after use. 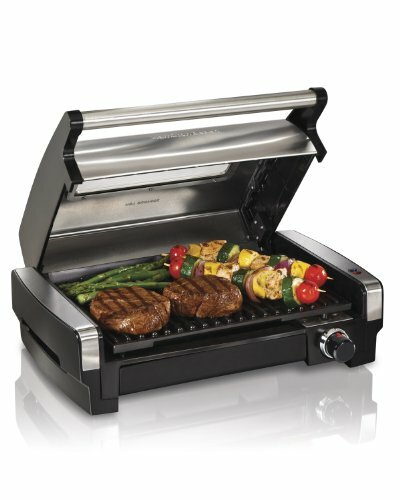 This indoor grill comes with a 1-inch adjustable hinge and can accommodate a variety of cuts of meats and vegetables. Slap a thick steak on there and be surprised at how well the top and bottom grill pans envelop the meat. This machine will never lead to buyer’s remorse, and George Foreman products are notorious for lasting years and years. This is another wonderful indoor grill from the beautiful small appliance stables of manufacturer Hamilton beach. What sets this grill apart from other available alternatives is its digital temperature display and arrow buttons for temperature adjustment, both not found in the previously reviewed options. This feature gives you the freedom to cook your food at the exact temperature desired. An automatic searing function also makes preparing your tender and juicy steak easy as pie. All you need do is set the desired cooking temperature using the arrow buttons and then press the sear button. The Hamilton Beach grill notifies you when the seat temperature is reached and you can then place your food inside. The food is seared for about 90 seconds, after which the grill automatically switches to the preset cooking temperature, offering you perfect control over the timing of your cooking, while still preventing unnecessary wastes of time in the preheating process. All in all, you can enjoy your perfectly grilled food under ten minutes with the Hamilton Beach Super Sear. The grill comes with a removable drip tray that collects fluid drippings from the food being cooked. The 100-square-inch cooking surface can accommodate up to four burgers with ease, just perfect for your family dinner. The floating hinge give room for thicker sandwiches or steaks, and the coating is non-stick, minimizing the need for butter or oil while cooking. All components are dishwasher safe and removable, making cleaning the grill easy as pie. While buying a toaster isn’t a huge life decision, having a quality toaster will save you time and get your day started the right way! These are the best indoor grills - all the taste of flame-kissed meat and veg with fewer downsides. Our reviews feature the top devices from top brands. In this article, we review three of the most highly rated rotisserie ovens available online today. It's one of the best and easiest ways to create great home meals.